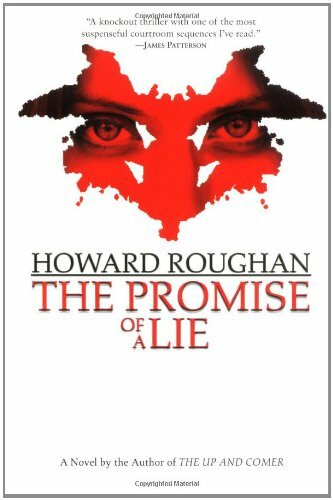 Howard Roughan's The Promise of a Lie is a competent psychological thriller. Roughan is able to piece his sentences together in a conversational style: his narrator is Dr. David Remler, a Manhattan psychotherapist and best-selling author. Remler unexpectedly made a name for himself and sold many copies because he testified in a murder trial of a rabbi who had killed his mistress. Remler gave his expert testimony, summarizing the ideas in his recently published book, The Human Pendulum, that even people who have a good character are perfectly capable of evil. The rabbi was found guilty and the jury said afterwards that it was Remler's testimony that helped them come to their verdict. Remler becomes a very minor celebrity, appearing on the Charlie Rose show. However, it is not this piece of psychology that goes to the heart of the plot. Roughan supplies that even earlier in the story, when Remler goes to a drinks party and gets into an argument with one of the other guests. His misogynist protagonist insists that women are emotionally manipulative while men are emotionally naïve. When Remler denies this, he is taunted with the question, haven't you ever been used by a woman? Remler says he never has, but the central idea of the book is that Remler is wrong, because he is expertly manipulated by one of his female patients, Sam Kent. The patient starts off her first session telling Remler that her problem is that she wants to kill her husband. Remler soon comes to the conclusion that her husband is a controlling and angry man and that the marriage is an unhealthy one. The woman tells Remler that she tried to kill herself a few years ago, and it seems that she is in a psychologically fragile state. Remler feels protective of his patient, and as a widower, he feels an attraction for her that he hasn't felt for a long time. When he accidentally runs into her at a charity event, she convinces him to go back to his apartment with her where they cook a meal together. This serious lapse of judgment leads to many of his subsequent problems. Soon after, Remler gets a late night phone call from her saying she has killed her husband, and he is scared that she has taken an overdose, so he rushes to her house. Soon he finds himself on trial for murder. A large portion of the book is devoted to the courtroom drama, which Roughan does well. The last section of the book provides some twists and turns, with a final climactic revelation that most experienced mystery devotees will have probably contemplated along the way. Roughan is skillful at providing a sketch of a character by describing a few actions rather than spelling it out literally. The plot itself is both somewhat formulaic and far-fetched. While the readers' comments at Amazon.com are largely positive, I had mixed feelings about the book, because it has the veneer of psychological sophistication but lacks depth. If you are just looking for entertainment, it is a fine way of passing the time. Robertson Dean reads the audiobook, keeping the tone lively and light even when the hero is talking about his dead wife, and the 10 or so hours go by quickly. The Promise of a Lie is another book that is improved by giving it only divided attention.